Architecture studio NEON created a site-specific installation called Cavalry 360° at the Chesters Roman Fort, in the north of England. 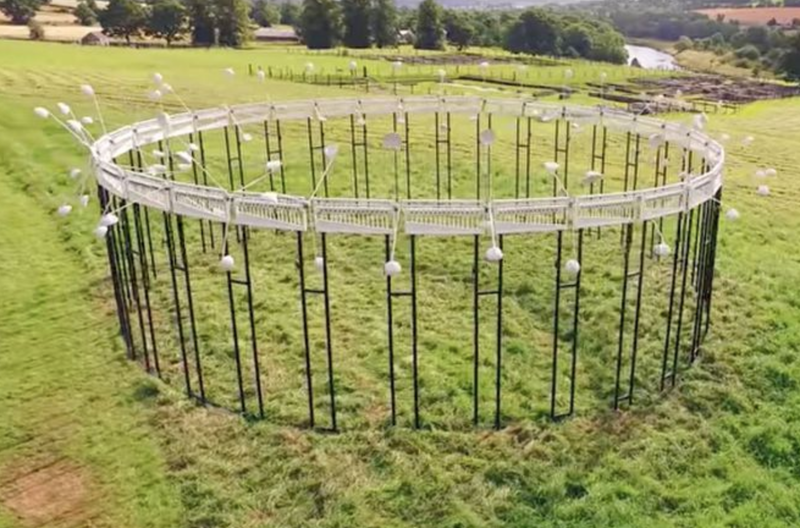 The piece (pictured at the top of this post and in the YouTube video at the end) is a large circle in which visitors can stand and hear the simulated sound of 500 cavalry horses galloping, as a reminder of the armies stationed at Hadrian's Wall in the 2nd century. One thing I especially like about the sculpture is that it uses wind energy to function. 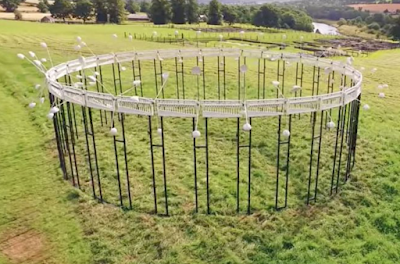 Comprised of 32 wind turbines, each of which has three arms with cups to catch the wind and power hundreds of "mini beaters," to create the sound of equine hoofs in a constantly changing pattern. The beaters are arranged to mimic a "Turma," a term in Latin term that refers to a Byzantine cavalry group of 30 horses. Visitors experience the beaters working at differing speeds as the wind rises and falls – and hear the sounds of horses galloping or trotting. English Heritage commissioned Cavalry 360° in the hopes that the unique kinetic piece, placed in the remarkable historic setting along Hadrian’s Wall, will be both thought-provoking and fun. It is designed to connect the viewer with the environment, to invite people to look through the work at the landscape beyond, and to pick up the sound on the wind.